With growth comes opportunity, however communities of color and low-income communities are often overlooked and left behind in times of change. A unique program in Seattle is working to ensure that some of Seattle’s most diverse neighborhoods actually benefit in a substantive way from the city’s rapid development. Called Community Cornerstones, the program was funded in 2011 by a HUD Community Challenge Grant along with local resources. Community Cornerstones is community-driven and builds on the existing strengths of Southeast Seattle neighborhoods. Southeast Seattle is diverse and integrated, with over 90 languages spoken and no neighborhood with an ethnic or racial majority for over 40 years. The 98118 zip code of Southeast Seattle has been touted as the most diverse zip codes in the nation. However, that stability and diversity is rapidly changing with the introduction of light rail stations and subsequent interest in private development at station areas in the community. 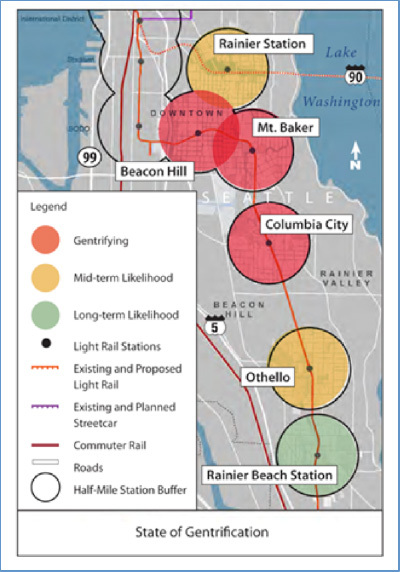 Data shows that all station areas in Southeast Seattle are already experiencing some amount of gentrification and demographic trends usually associated with displacement. These effects can weaken the economic and social infrastructure needed to build a viable community where existing communities can prosper in place during this period of change. Community Cornerstones is managed by the City of Seattle Office of Housing in partnership with the Office of Economic Development, Department of Planning and Development, and the Department of Neighborhoods. Additional partners include the University of Washington, Washington State Housing Finance Commission, Impact Capital, and the Rainier Valley Community Development Fund. Community Cornerstones has demonstrated the effectiveness of a collective impact model of community development to achieve outcomes that directly address issues of race and social inequity. Breaking down silos and aligning resources across institutions has allowed for more comprehensive strategies to address the challenges of gentrification and displacement. Building the capacity of underrepresented communities to be active decision makers in the planning and implementation of growth has increased the effectiveness of strategies that actually work for those most impacted by neighborhood change. 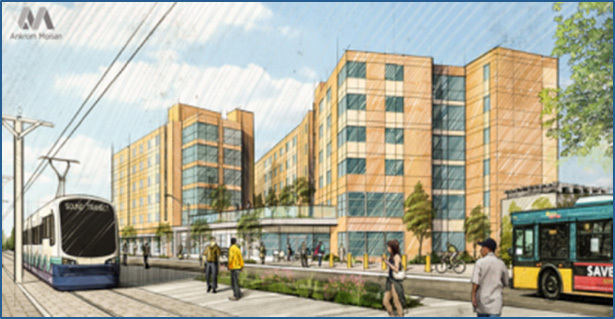 Equitable Transit-Oriented-Development Loan Program: The City and its funding partners have deployed $6.7 million to finance nonprofit developers’ purchase of three vacant parcels near light rail stations for affordable housing and mixed-use developments. These three projects will provide 290 units of affordable, primarily family-oriented housing as well as office space, childcare, community meeting rooms, local retail space and a cultural center. These developments are designed to serve the interests and needs of current community residents. Commercial Stability Strategy: A coalition consisting of community organizations, a community development fund, business owners and property owners has created an equitable economic development strategy for the multi-cultural business district at the Othello station. In addition, a business technical assistance program has served 130 immigrant and refugee owned businesses through workshops, one-on-one services, and direct grants. A retail study and new branding strategy is helping to promote the existing businesses and work with new commercial developments to attract tenants that complement the multi-cultural character of goods and services provided within the community. These strategies seek to preserve the integrity and enhance the development of Southeast Seattle businesses. 3. Planning for a Shared Multi-Cultural Center: Over the past three years a Multicultural Coalition made up of twelve immigrant and refugee-serving community organizations has worked to strengthen an existing network of cultural centers and plan for a new shared cultural center in Southeast Seattle. Five large community events were held for the planning of a multi-cultural center engaging over 700 participants in exercises conducted simultaneously in nine different languages. With the help of technical assistance contracts and consultations, the Multicultural Coalition as well as community leaders and individual organizations have developed a shared agenda, advocated for one another, and shared valuable skills and resources. 4. Community Engagement: Culturally competent and inclusive engagement methods are used to build lines of communication and trust between the program’s institutional partners and historically underrepresented communities. Trusted community leaders were contracted with to engage their communities in the formation of the Multi-Cultural Coalition and the implementation of the business technical assistance program. This model of culturally competent outreach was also critical to building relationships with the 90 immigrant and refugee owned businesses at the Othello station. These strategies come together to form a cohesive plan for combating the threats of gentrification and displacement in Southeast Seattle communities. Community Cornerstones partnered with the University of Washington in order to create innovative equitable development measures and evaluate the program. The University of Washington prepared a case study which details the project, its strategies, and its implications for the future. That case study can be found here. Community Cornerstones’ comprehensive and community-driven approach can inspire other place-based investment strategies where gentrification and displacement are community concerns. Leading with the community’s concerns and supporting communities to actualize their visions makes Community Cornerstones a very promising program.